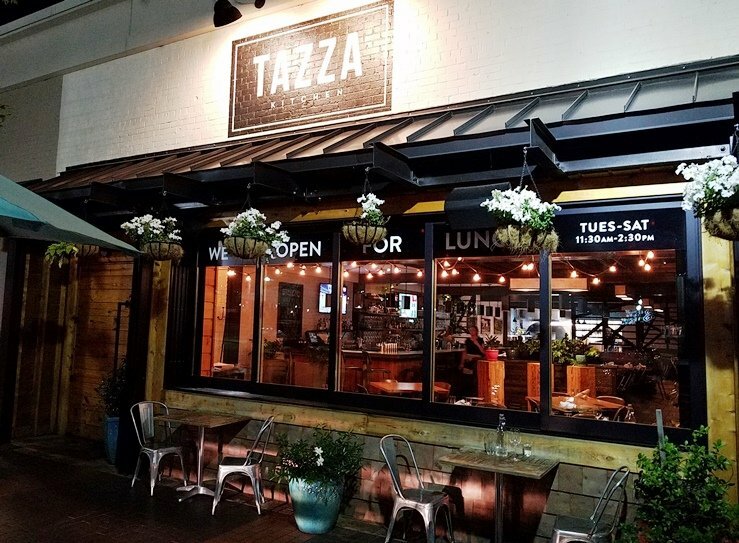 Located in the back, right-hand corner of Cameron Village (looking at it from Peace Street), Tazza Kitchen is barely recognizable from its previous incarnation. Out front the fireplace has been removed and it’s got a feel reminiscent of my visits to wine country in CA. Grained wood paneling, simple ironwork and party lighting overhead. 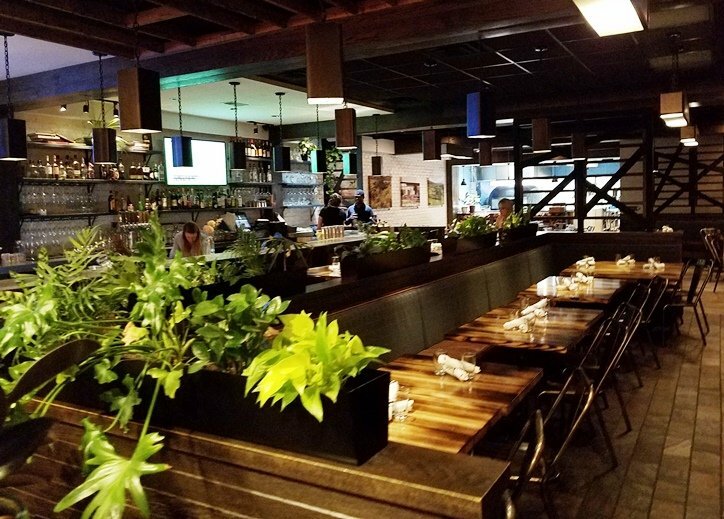 Inside Tazza Kitchen has a very cozy and romantic feel to the place with white brick, dark woods and a stone-topped bar. Plenty of staff on-hand for my visit but they’re probably still in training mode on Day 2. I grab a menu and there are a couple of items reminiscent of Cafe Caturra: a nice wine list, meatballs, habanero maple chili and a few other hold-overs. I grab a glass of Uruguayan tannat and figure I’ll order up a sausage pizza. By surprise, a plate of meatballs show up in front of me, comped by the house. Looks like they keep close tabs on their social media and picked up a tweet of mine, I’ll have to be more careful next time! 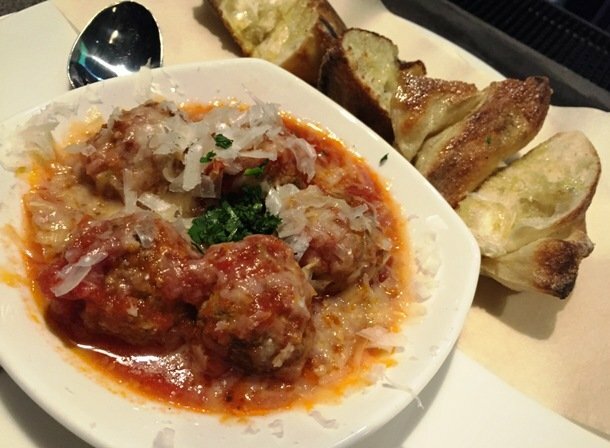 The meatballs are a mix of beef, pork and veal, nicely done but a bit loose. The bread is very good, charred a bit with some olive oil, yum! I notice in back that they’ve gotten rid of the original oven but look to have imported in a special pizza oven, I’ll find out more about the oven the next time I visit. Then my pizza comes out, maybe 14″ in diameter and it looks fantastico! I pull the crust up and it has charred bits on the bottom, the sign of a good Neapolitan pie. 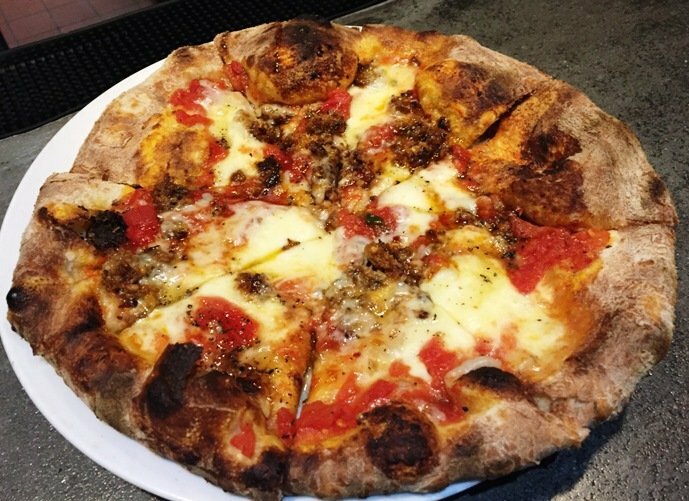 With tasty and lighter sauce on top, mix of provolone and mozz with the sausage, this pie is not a traditional Neapolitan but pretty darn close! Thin crust, lighter-weight toppings and definitely delicious! With two glasses of wine and the pie which is a good meal for one person, my tab ran about $30. Service at the bar was excellent, they have plenty of staff on hand in their shakedown phase. Oh and yes, a hostess stand which means Tazza is more formal than Cafe Caturra. 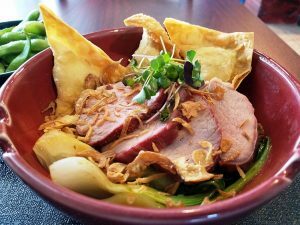 But I am really happy with what I experience on my first visit to Tazza Kitchen. A smallish, tight menu of high quality items in a great setting works for me. Especially when it’s a half-mile from my home!